If you are a cowboy action shooter, changes are that you have selected one of your CAS guns for hunting, home defense and you may even carry a SA. Hornady has released their product line-up for 2009 and one of their new products is the .45 Colt LEVERevolution® round. The new LEVERevolution® round is loaded to SAAMI spec pressure so it’s safe for all 45 Colt firearms. According to Federal, the specially designed FTX™ bullet delivers exceptional terminal performance that makes it a great choice for hunting. 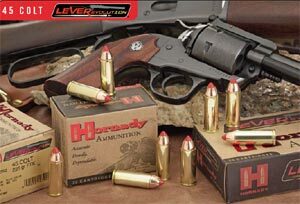 If you want to take a classic 45 Colt out in the field and have 100% peace of mind that there’s no chance it will damage the gun — and deliver LEVERevolution® performance you’ve come to trust — Hornady has the answer.